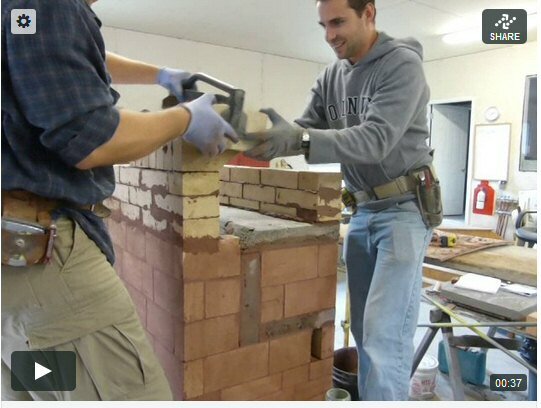 instructor John McDougall, who hosted the workshop, Nathan Lamberts, a mason from Guelph ON. and Scott Horrocks from Rupert QC, who is planning to build a house with a masonry heater in Nova Scotia. Not shown: Mathew McCartney, a mason from Kingston, ON. HMED is MHA's Heater Mason Education Development program. for this heater during the workshop. Setting the insulating base slab into a bed of mortar. directions, the bucket does not spin. John Scott re-assembles the firebox floor mold to do another casting. on the bag, so getting the water right was an important part of this demonstration. Vibrating the concrete with a stinger. leave the surface open for drying. Building the mold for the 3 oven pieces. Note that these slabs are steel reinforced. improvised separators that will create lapjoints between the slabs. Meanwhile, at the heater build, laying out the first course. A view of John's beautiful new shop. Check out his masonry boiler fired hydronic slab. Outer wall of the two shell firebox, which has a replaceable inner liner. Washing up the inner shell, which will be visible. slightly wetter. A vibrating table would handle a stiff mix like this, but would need beefier molds. Detail of the lap joint in the ceiling slabs. Intstalling the bake oven floor. Installing the bake oven back. Gasketing the rear of the bake oven rear slab. John Scott eyeballs a compound cut on the Karl Dahm saw. This saw is very quiet and smooth. blade, by a long shot, that I have ever heard. In the video, when the cut starts, there is not much extra noise above just the sound of the motor. Target saw and regular blade starting up about 25 ft. away from the camera. Height adjustment course above the bake oven to bring both sides level. mortaring them together on the bench, and installing them in bulk. Stan starts the side channels. Each day there is a classroom component to HMED. For this course, we also added the combustion seminar that I have done a couple of times at Wildacres. Visible on the table is a Testo 330-2 gas analyzer (black case). In front of it is a Condar portable dilution tunnel, used to sample PM-2.5 particulates (smoke). Adding a cleanout for above the bake oven. Ready to install the ceiling slabs. with the facing for heat transfer. Bonding out the facing bricks, and discussing the various issues that may come up. Cutting a connection opening and a cleanout into an 8x12 clay flue liner. greater depth of cut than the Karl Dahm saw does. Setting jack lines with the laser. long screws against the ceiling slabs, to prevent the plywood from moving. Finished result. Three pieces are cut from one flue liner. The chimney connection is dismantled and modified to accomodate a heated bench layout. firebox door, to allow access to the ashbox where the heater is slab-on-grade such as this. A very important discussion about firewood. John is demonstrating the use of a moisture meter. difference, but plans to do it this winter. We had a look inside the oven cleanout. as several interesting structural and envelope thermal issues.